The categories of Hip Hop Battles are: Solo and Crews. Starting January 1st, 2018, Hip-Hop battles are allowed for Children solos and crews. 1. Music: Organizer’s music in different Hip Hop styles. 2. Duration of Performance: 4-6 entries, each 0:30-1:00 min. Each group of competitors (heats) begins dancing together in the preliminary round with a one-minute performance in “New Style”. Then they dance 2 times 30-40 seconds in some other Style: Ragga or R&B or House or D. Step or Popping or others, but not more than 6 dancers on the floor. The final performance is “Old School”, again one minute. The Best 16 competitors will be qualifi ed and continue with battles (knock out system). If there are 18 dancers or more in the 1st round, Adjudicators should qualify the best 16. In the first round, the Judges evaluate each dancer with the points from 1 to 10. 10- outstanding- dancer is using different styles, performing various elements and bringing personal note in performance. those that they want into the next round. comes from the given letters and crosses. written form (made by Scrutineer and the Chairman of Judges). If there is 10 to 17 competitors in the 1st round, adjudicators will qualify only 8 dancers, 2 of class A (4 points), 2 of class B (3 points), 2 of class C (2 points), and 2 of class D (1 point). Then in next round there are only 4 battles (A1/D8; B3/C6; A2/D7; B4/C5). The winners of these four battles will go on to two battles and fi nally will be one battle for 1st place and one battle for 3rd place. If there is less than 10 competitors in the 1st round , adjudicators will qualify only 4 dancers, one of each class and then there are only 2 battles (A1/D4 and B2/C3); followed by battles of the winners of previous 2 battles (one battle for 1st place and one battle for 3rd place). 3. Duration of Performance: 150-180 seconds (2:30 – 3:00 minutes) in fi rst round (Show). The “Semifi nal-Battle”(3. and 4. place) will have up to 5 entries (different styles). 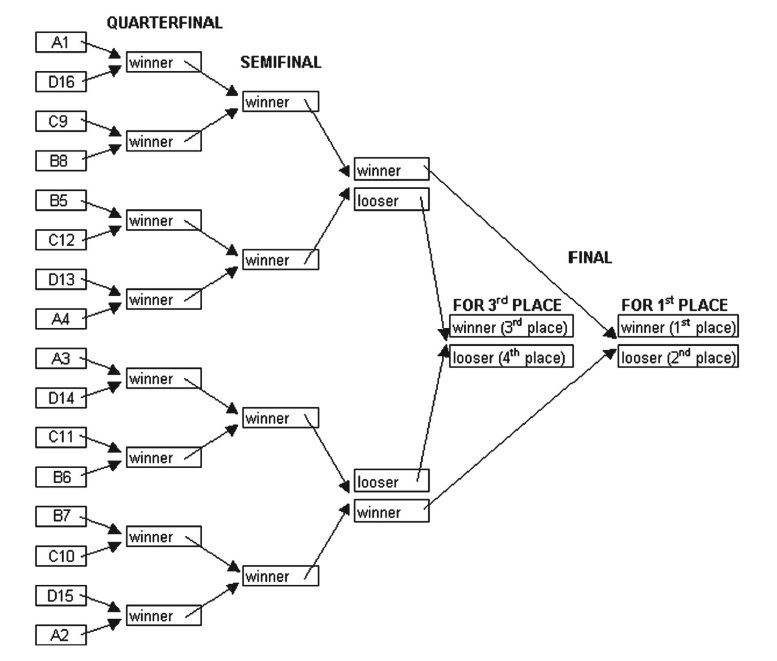 The “Final-Battle” up to 7 entries (different styles). 5. If one team disturbs another team’s performance or endangers another team’s safety, a loss of evaluation points will result. 6. Based on the first round results, the Chairman of Judges will determine the order of “battles” between 1st- 2nd ranked teams and the 3rd- 4th ranked teams. 7. All other rules are as outlined under SOLO. First round is a show of teams who will dance to their own music. The Adjudicators will evaluate and select the four best teams. The Adjudicators give the best team 4 points (A), the next best team 3 points(B), the next best team 2 points(C) and the next best team 1 point(D) .Only the 4 best teams will battle to the Organizer’s music (3rd. against 4th and 1st against 2nd). If there are more than 8 teams in the 1st=preliminary round, a Supervisor together with a Chairman of Judges may decide to ask for additional crosses for team/teams on the next position after 4 best teams (cross means placement). If the time frame allows, Organizer Chairman and Supervisor can decide, to use the big spider (as Solos), so there go 8 or 16 teams into the battles.